HALF-CENTURY celebrations for the Rotary Club of Noble Park included a new drinking fountain and accolades for two long-serving members. Keith Maxwell joined the club 25 years ago and said it formed when Springvale Rotarians were looking to expand. “They came to Noble Park and talked to all the businessmen and said ‘why don’t you start a club here?’” he said. They did just that on 15 June 1965, with 27 members. 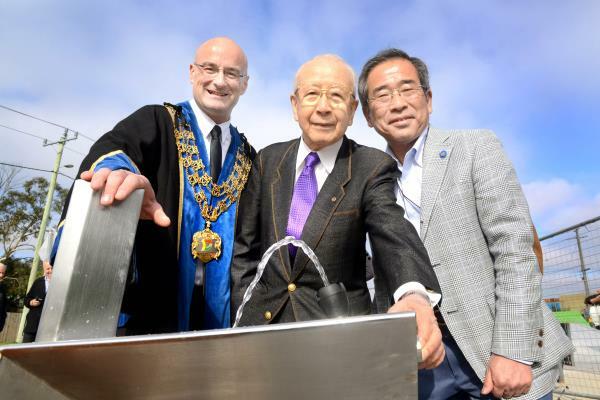 In 1977 they formed a sister club relationship with the Rotary Club of Kofu in Japan, whose members donated a drinking fountain when they made their first visit to Noble Park in 1976. It was removed during redevelopments in Douglas Street, so City of Greater Dandenong last week replaced it at Ross Reserve. Mayor Sean O’Reilly hosted an official unveiling last Friday, 12 June, alongside guests from Kofu. About 10 Kofu Rotarians also joined the club’s anniversary celebrations at Southern Golf Club in Keysborough on Sunday 14 June. Yuhichi Uehara presented a sapphire pin to Paul Harris Fellow Anne de Kretser who is the director of the Monash University Melbourne Centre for Japanese Language Education. She received the honour for her services to relationships between Australia and Japan. Anne visited Kofu in 1977 through an exchange program and is now an interpreter. Paul Harris Fellow John Williams, a Noble Park member for 40 years, received a third sapphire pin for his service to the community. Since its inception Rotary Club of Noble Park has run the Junior Citizen Award, now named for late member Arthur Williams, and recognised and rewarded more than 180 students. “The citizenship must cover academic, community involvement and home involvement,” Mr Maxwell said. The club supports the Dolly Parton Imagination Library with $10,000 which supplies a book a month to children from age 18 months to five years. “It’s a simple book designed to the level of the student,” Mr Maxwell said. “By the time they get to school they have a little bit of literacy – 88 per cent of the school population in Noble Park, English is their second language. Members also assist with remedial reading programs and have donated books to classrooms. The club has been heavily involved in Rotary Youth Exchange, which sends young people overseas to experience their profession in a different setting. “They empower young people to have a go,” Mr Maxwell said. He observed an Interplast team in Laos in 2005-’06, helping doctors and nurses to perform 68 cleft palate operations in eight days. It was their last trip to that location because they’d instituted practices to make the local team self-sustainable. “We teach them how to fish,” Mr Maxwell said.